Linksys wasn’t going to be left out of the mesh WiFi revolution, and the Velop system is the company’s alternative to things like Google Wifi and NETGEAR Orbi. 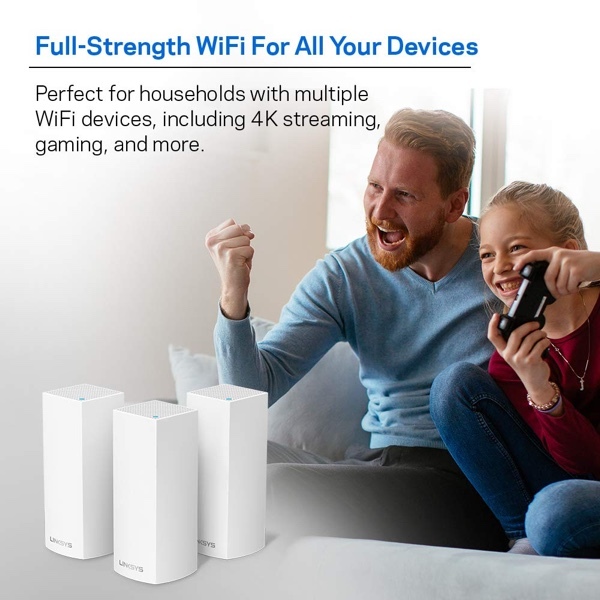 It’s a product that has been well received, and right now you can pick your own set of two or even three routers up for a steal. Normally available for around $350, this two-pack can be yours right now for a cool $100 off, which is the best price that has been available on the pack for a good while now. But that’s not all, if you’re planning to take the three-pack route, that too is available for a cool $100 off, bringing the price down to just $399.80 from its usual $500. If you pick these up you should be good to cover anything up to 6,000 square feet, so even if you’re living in a fairly sizable multistorey home you shouldn’t find yourself fighting with dead spots any time soon. There are some pretty funky features available via the free Linksys app, too, and with parental controls built right in this is a great option for anyone wanting to keep their little ones safe online. We also think that the Velop routers are some of the best looking available, and they aren’t huge either. If you like your tech to get our of the way and just work, then these are an option that are absolutely worth checking out. Do it quickly though, this deal isn’t going to be around forever.